Following a divisive referendum campaign, the British people voted to leave the European Union on the 23rd of June, writes Leon Kuebler for WhiskyInvestDirect. Brexiteers may have toasted this victory with a celebratory dram. Remain supporters, on the other hand, possibly felt the need for a stiff drink. The relationship between Brexit and Scotch whisky, however, is more important than the latter’s role as a toast-maker (or sorrow-drowner). After all, in 2015, 93% of Scotch whisky sales occurred overseas, accounting for a quarter of all UK food and drink exports. Like any major export, Brexit affects Scotch by changing two crucial factors: the United Kingdom’s trading relations; and the value of the British Pound. At this stage, the impact of Brexit on trade deals is unclear. The new Prime Minister, Theresa May, has indicated that she will not trigger Article 50, starting the UK's two-year negotiations to leave the EU, until 2017 at the earliest. Moreover, as The Economist magazine suggests, major nations outside of the EU, such as Australia, India and the United States (all key destinations for Scotch), are likely to wait until the terms of Britain’s post-Brexit relations with the EU are clear before beginning their own negotiations. For these reasons, it is too early to speculate on what effect Brexit will have on trade. But the same is not true for its impact on the currency. Sterling crashed to a 31-year low in the 24 hours following the referendum result. Despite fluctuations since, the Pound remains far below its pre-Brexit value against the US Dollar. Standard economic theory suggests that a weak currency is good for exporters, as it makes their products cheaper to overseas buyers. A falling Pound should, therefore, provide a boon to exports of Scotch. Does history bear this out? To see the impact of Sterling on exports of Scotch whisky, we need to factor in the Pound's strength relative to other currencies over previous years. The ‘Effective exchange rate index’ (ERI) is calculated and published by the Bank of England. It shows the relative strength of Sterling compared to the currencies of Britain’s trading partners. When applied to the Sterling value of Scotch whisky exports, the effective exchange rate indicates whether consumers overseas have spent more or less of their own currencies than in the previous year on Scotch whisky. This figure gives a more accurate indicator of consumption patterns, by removing distortions caused by the exchange rate. The above chart shows the GBP value of Scotch whisky exports (yellow) against the same value adjusted by the annual average of Sterling’s effective exchange rate (red) over the last two decades. 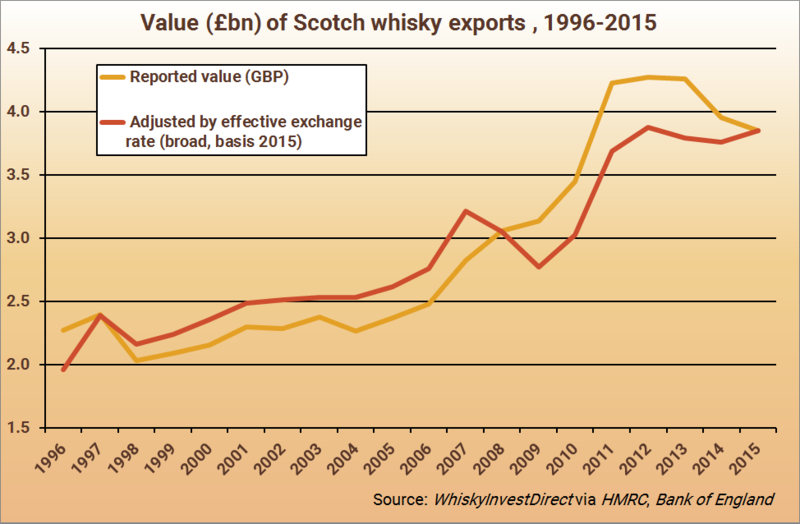 As the chart shows, changes in the value of Sterling can have a huge impact on the relative value of Scotch exports. The most dramatic example occurred in 2008 and 2009, as the Bank of England slashed interest rates to try and stem the economic impact of the global financial crisis, which began in 2007. In 2009, the Pound value of Scotch exports totalled 11% more than 2007. Yet sales were down 4% by volume, and the actual amount spent by overseas buyers had dropped by 14%. Why? Because the value of Pounds Sterling relative to other currencies declined by one fifth – meaning that the same bottle of Scotch sold overseas in 2009 was, in effect, worth an extra 20% in Pounds Sterling than in 2007. The opposite effect has occurred in recent years, as the Pound has strengthened since the financial crisis eased. The GBP value of Scotch exports peaked in 2012, at £4.27bn, before falling over successive years to 2015’s value of £3.85bn. In Sterling terms, therefore, last year’s exports of Scotch were 10% lower than three years ago. However, the effective exchange rate shows that Sterling has strengthened by 10% over the same period. So, once Sterling is removed from the equation, we can see that the amount spent on Scotch in 2015 showed, in foreign currency terms, a 2.5% increase on 2014. More significantly still, non-Sterling expenditure on Scotch in 2015 almost matched the 2012 peak. The steep fall in the value of Sterling post-Brexit should, then, be good news to for Scotch exporters – although this boost may not occur immediately. This year so far, the ERI-adjusted cost of Scotch exports declined year-on-year in both Q1 and Q2, even though the Pound itself had already weakened year-on-year by 2.3% and 6.1% respectively ahead of the Brexit referendum. That may indicate a weakening of export demand overall – although the increase in the volume of Scotch sent overseas in 2016 to date suggests that global demand remains strong. 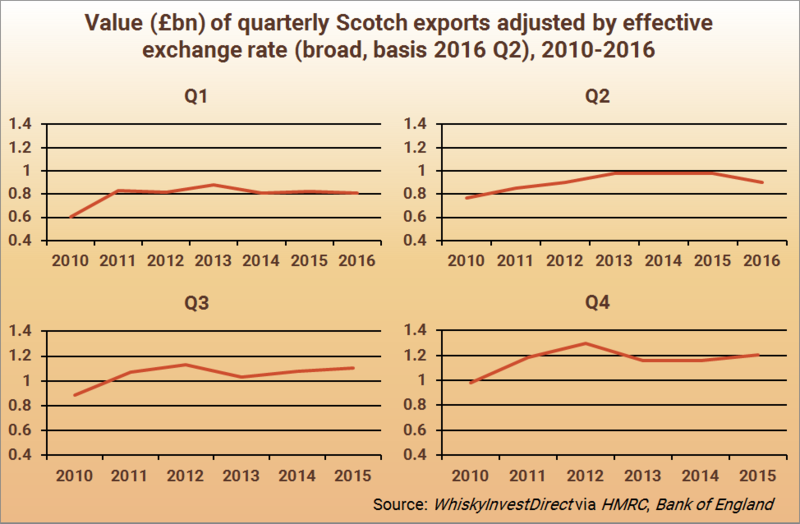 But while the declining Pound hasn't yet aided the Sterling value of Scotch exports in 2016, there are two reasons why its impact in the second half of the year may prove more notable than in H1. Firstly, the post-Brexit weakness of the Pound is at levels largely unseen in recent history. Since 1997, there have only been three months when the Pound’s broad effective exchange rate has been weaker than August 2016’s average figure (January 2009, and January and March of 2010). Pre-Brexit, in contrast, the effective exchange rate of Sterling (Q2 2016) was lower than in 2014 or 2015, but was still higher than at any point in the five years between Q4 2008 and Q4 2013. So while Sterling’s value has been falling throughout 2016, GBP’s strength pre-Brexit was still relatively high, whereas post-Brexit it is historically low. Secondly, the majority of Scotch exports occur in the second half of the calendar. Over the last five years, July-December has averaged 56% of the annual value of Scotch whisky exports, as sales increase in the build-up to Christmas. Now, therefore, the majority of 2016’s Scotch whisky exports are likely to occur during a period of historical weakness for the Pound. While the relationship between Sterling’s strength and the value of Scotch whisky exports is not absolute, recent experience suggests that the weak Pound should boost the industry's revenues. Beyond then, the key long-term factor for Scotch whisky will be the form Brexit takes – and its inevitable impact on Sterling’s value. But to date, demand for Scotch whisky has remained steady over the last 6 years, both in the amount of foreign currency spent and the volume of whisky consumed. All things considered, a truly dramatic change in Britain's trading relations would be needed to turn the world away from Scotch.